Here at Sound Training, we love our recording studios; nothing excites us more than a fancy new piece of analog gear! However, we also appreciate and embrace the opportunities that technological developments are bringing to our industry. Producers, engineers and composers can now develop their own new creative audio tools as synths, effects and plugins. This potential was highlighted last weekend at a conference hosted by NUI Maynooth (thanks to Iain McCurdy for organising), celebrating the audio programming language Csound. A number of our students and staff presented their work to the world’s best Academics, Composers, Sound Designers and Audio Professionals. 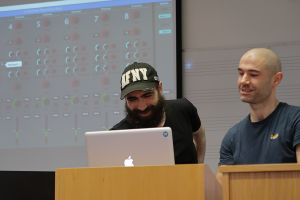 Martin Crowley and James Kelly (students from our Degree course in conjunction with IADT) talked about their work developing new software designed to emulate live sound venues. Their plugins allow users to learn about live sound and develop live shows on their computers. Martin and James worked on this Enterprise Ireland funded project during the Summer of their second year, led by Geoffrey Perrin in IADT and Brian and Skip at Sound Training. One of our erasmus students, Federico Russo, also presented his new instrument for live performance; he plans to use this for one of his upcoming concerts in Rome. Our lecturers Thom and Brian also spoke about their work. Thom is developing new creative audio tools for surround sound. Brian recently launched an iPhone/iPad app for live vocal processing (think Kanye West and Bon Iver!). 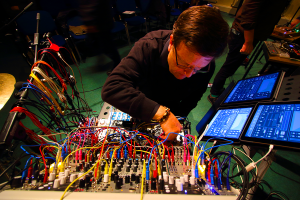 The conference also included two very inspiring concerts, highlighting the potential of live performers interacting with technology (for example, a dancer interacting with sensors that trigger musical notes on a computer…a brand new instrument!). As with many areas of modern life, technology is changing the music industry. These changes bring many exciting new employment and creative prospects for students of audio production! If you’re interested in learning more about creative audio tools and innovation, have a look at our courses. Ranging from weekend beginners courses to Masters programmes, there’s something for all levels and interests.